After losing a heartbreaker the night before, the Cubs won in decisive fashion were able to avoid their first three game losing streak of the season. With Saturday’s win , the Cubs have matched the highest April win total in franchise history with No. 16 — and there are three more games remaining. The team also won 16 in April 1969. Lou said before the seasson started that he wanted to get the Cubs off to a hot starts, especially since their are very few home games in September. The Cubs still hold a 1 1/2 game lead over second place St. Louis and have a chance to make this a winning road trip with a win over the Nationals tomorrow. It was a game that we have gotten used to the Cubs winning, but in the end, backup catcher Wil Nieves’ hit a two-run, walk-off home run off Bob Howry for the win. It was Neves’ first career home run. The Cubs could not get a clutch hit, leaving ten men on base, including an eighth inning one out bases loaded situation. The loss took away from an incredible Reed Johnson catch that is being called one of the best catches ever. Ryan Dempster also pitched well, giving up only two earned runs in seven innings. Dempster went deep into the game and other than a bad first inning, really should have gotten his fourth win. shutout innings, allowing five hits and striking out five. He did walk four batters, but was able to get himself out of trouble every time. The last three Cubs starters, Marquis, Dempster, and Zambrano all went seven innings, a relief for a bullpen that was definately taxed. The Cubs were sparked by tablesetters Reed Johnson and Ryan Theriot. WIth Washington’s Matt Chico on the mound, Johson, Theriot, and Lee were 6-6 in their first three at bats. Johnson and Theriot led off the game with back to back singles, followed by a Lee single to score the first run of the game. Aramis popped out, but Fukudome walked to load the bases. DeRosa hit a single to score Theriot and Lee, making it a 3-0 ballgame. In the top of the third and one out, Johnson singled and reached third on a Theriot single. Both runners scored on Derek Lee’s double, and after just three innings, the Cubs led 5-0. They may have scored more, but Derek Lee was caught stealing third base while Ramirez was up. More on that later. Aramis would later hit a two run double to give the Cubs a 7-0 lead. Michael Wuertz looked a little better and Jon Lieber closed the game. I know that Lou wants the Cubs to be more aggressive, especially when it comes to stealing third. The only trouble is that the Cubs have gotten caught twice trying to steal third in the past two games. It didn’t really cost them on Saturday, but it did on Friday. With one out, Reed Johson was hit by a pitch. He scored on a Ryan Theriot double, cutting the Nationals lead in half, 2-1. With Derek Lee up to bat, Theriot was caught trying to steal third. Lee would walk and Ramirez would reach on an infield single. Who knows what may have happened if Theriot wasn’t thrown out? Theriot was later thrown out at second on a strike’em out throw’em out. Pinella still feels it was the right move. “A lot of good things are happening that are not noticed by the casual fan,” Piniella said of his strategy. “One, pitchers are slide-stepping against us a lot more. Two, infielders are holding runners on, which are creating more holes, and catchers are calling more fastballs, and those are all advantages. Theriot ran on a changeup, which was a good pitch to run on. Fair enough. The one thing that Bob Brenly mentioned after Theriot was caught Friday and Lee on Saturday is that the runners are not getting good secondary leads and they need to be moving towards second as the pitcher is winding up instead of flat footed. I am sure Lou and his staff will adress this soon. The Cubs would love nothing more than to win tomorrow, take the series, make this a winning road trip, and get some momentum going into a big three game set at home against Milwaukee. 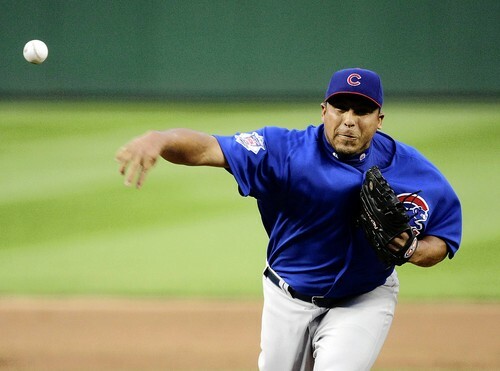 Lilly will start for the Cubs while John Lannan will go for the Nationals. Like Odalis Perez, the Nats’ starter on Friday, Lannan has pitched well but his record doesn’t indicate this because of Washington’s lackluster bats. Lilly had a good outing last time and looks to build on that start. Let’s hope the Cubs can continue to make franchise history on this road trip, winning it’s seventeenth game in April. If you didn’t love Reed Johnson before, you have to love him now. He’s the kind of player who goes all out for the team.